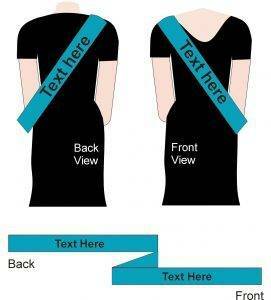 Custom printed sashes are a great addition to any party, and we can print them on one half of the ribbon so that the text is only visible from either the front or the back, or we can print aliong the full length of the ribbon so that the text is visible from the front and the back of the wearer. We print in two specific areas so the text is positioned in the optimum area for viewing. We haved a great range of coloured ribbon to ensure that we can give you the ribbon of your choice. 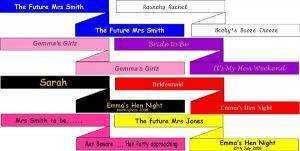 Not all ribbon colours are suitable for all of the text colours that we offer. In general the darker ribbon colours give the best results when we print them with our metallic silver or metallic gold print colour. The other text colours do not have the opacifying power to give a good colour contrast on the dark colours. 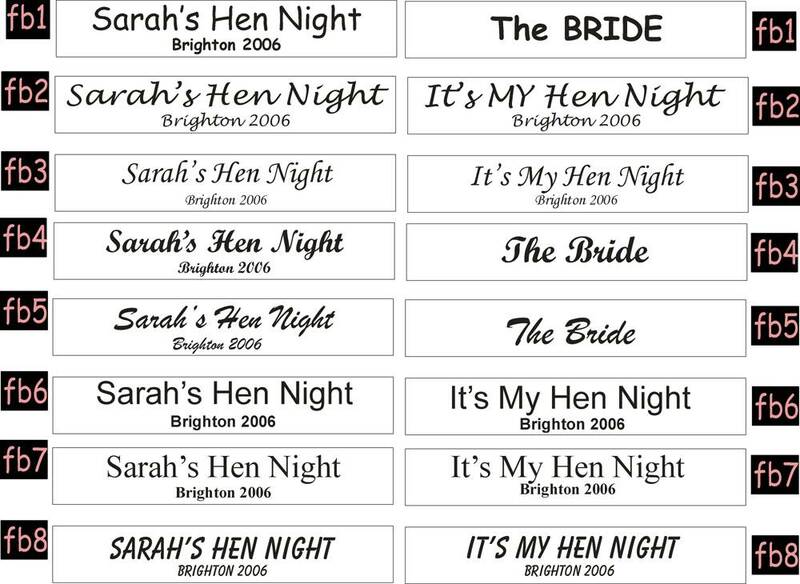 By contrast the white ribbon is suitable for all colours of custom printed sashes. View our other personalised sashes range by clicking the link. 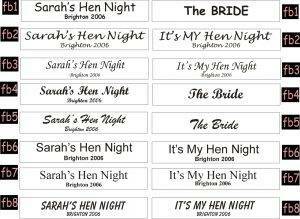 We can also add various pieces of clipart to your sash – balloons, hens, cocktail glasses, ages and other items specifically for hen nights and birthdays. Occasionally we are asked if we can add a photograph on to a sash. We cannot offer photographic quality but if you select a white sash and black text. 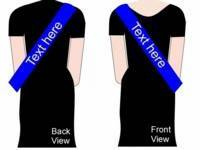 Then if the photo is of good quality we can usually print a good line image on the sash. The sashes are fastened by using a hook and loop pad (similar to velcro), which is self adhesive. You can then stick on either side of the sash. You can then adjust the sash to get the best fit before applying the pads . In this way you should get a perfect fit. * By default, our sashes are printed so that they can be worn over the right shoulder.If you require them for use over the left hand shoulder then please tell us when placing the order. * You can choose to add one of our standard images to your sash at no extra charge.